Cucumber Cage Training! 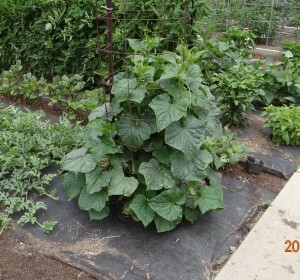 We like to keep our cucumbers off the ground to reduce their exposure to insects, diseases and other garden pests. We like to make our cucumber cages using the same materials that we prefer to use for our tomato cages. We make these cages out of a roll of concrete reinforcing wire that can be purchased from Lowes or Home Depot. To cut the wire we use a Fencing Tool which can be bought at Lowes and Tractor Supply Company. This tool is specially designed for cutting and bending his type of heavy wire. We recently bought a pair at Lowes for about $16.00 and was well worth the effort to find a pair. You basically cut a length of wire fence to make the diameter cage that you prefer. Then cut it off the roll leaving the “fingers” to bend back to secure the cage in the shape of a cylinder. Then cut off the bottom “loop” of wire, again leaving the “fingers” to stab in the ground to stabilize the cage. These cages last for many years. You can also use “half” cages to put around peppers or eggplant. After the cucumbers start to grow into a vine, lift the vines into the cage an let them lean against the wire “grid”. Come back every 2-3 days depending on how fast the vines are growing. Each time, tuck the vines towards the inside of the cage so they can be supported. You must do this gently so the vines don’t break. Sometimes we will use a “tie”, of some sort, to attach the vine to the cage, but we try to avoid doing this. When the cucumbers develop they are usually suspended and grow long and straight.